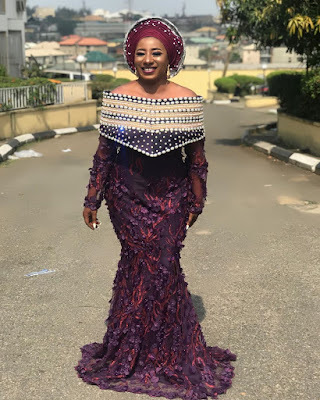 Nollywood Actress, Mide Martins Abiodun steps out looking so beautiful in the extravagant gown. It is a chic lace style with off-shoulder, having rows of accessories round the shoulder. It has the right choice of color which goes perfectly with the silver accessories. Mide Martins indeed super gorgeous!